The headscratching staff has never really understood the Bernie Sanders connection to millennials, although The Bernie Sanders Connection would be a good name for a rock band (with apologies to Dave Barry). 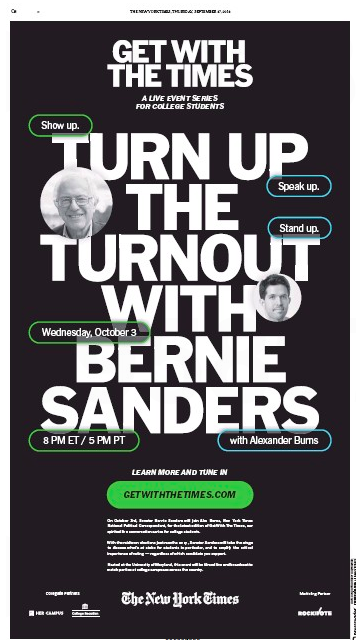 But the New York Times, apparently, totally gets it, as this full-page ad in Thursday’s edition illustrates. There are also, as you might suspect, New York Times “partners” to help corral the young’uns. So, to recap: The Grey Lady is joining up with the white-haired guy (and a bunch of corporate shills) to monetize some green behind the ears kids. Get with the Times, indeed. This entry was posted in Uncategorized and tagged Alex Burns, Bernie Sanders, College Reaction, Dave Barry, Get with the Times, good name for a rock band, green behind the ears, Her Campus, millennials, New York Times, The Bernie Sanders Connection. Bookmark the permalink.